A native of New York City, Joseph moved to Colorado over 30 years ago, where he lived and worked at the base of the Rocky Mountains. He is a member of the Portrait Society of America and the American Society of Portrait Artists. Joseph's art is inspired by the writings of Robert Henri, the orchestration of John Singer Sargent, and the nuance of Giovanni Boldini. Joseph's approach to the canvas is a blend of artistic inspiration, a traditional sense of form and application, and an energetic excitement that transcends the stroke of the brush. "People will always be a major focal point of my art. It is what makes our time here so interesting, life and the people who live it. It is in everyday moments that people have the greatest impact on one another. A portrait painting must be a realization of the model; it must capture the essence of the person's presence." There are many ways to paint. There are many ways to see. 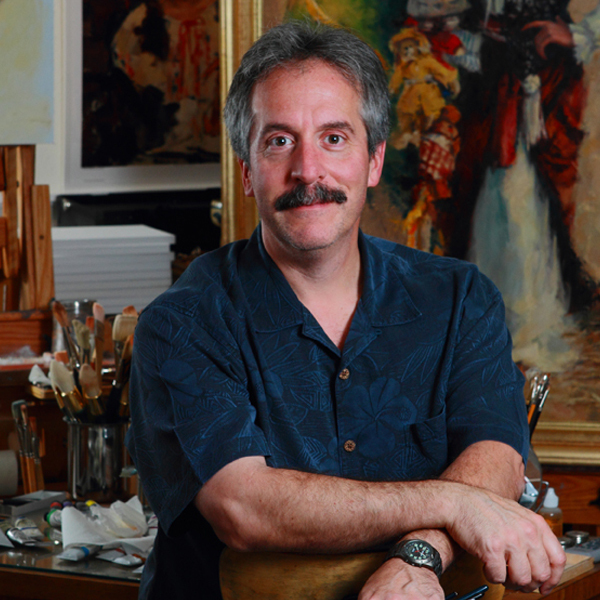 Bonomo’s paintings come from the eyes of a lifetime immersed in the lives of people and the impact they leave. Bonomo paints the figure and portrait as evidence of one's existence; capturing the joy, hope, and emotion of this world. His palette tends to be strong, yet balanced. His brushstroke is energetic yet knows conformity. The balance and mastery over the canvas will be his trademark. Reason and inspiration has been his guide. Observation, exploration, and dedication have been his teachers. Bonomo pulls from a pool of knowledge accumulated by artists past and present with an exuberance that translates to his work. Although Bonomo is inherently a self-taught artist, he takes great care in his personal studies of the masters and innovators of the art world. After retiring from the Colorado Springs Police Force Joe has settled in Tennessee with his lovely wife.